The rewards for another late night at the mist-nets were 15 more Storm Petrels and, eventually, at nearly 2am, the first Leach's Petrel of the year. There was little to report during diurnal hours other than 2 Green Sandpipers, a Red-breasted Merganser and a Swift. 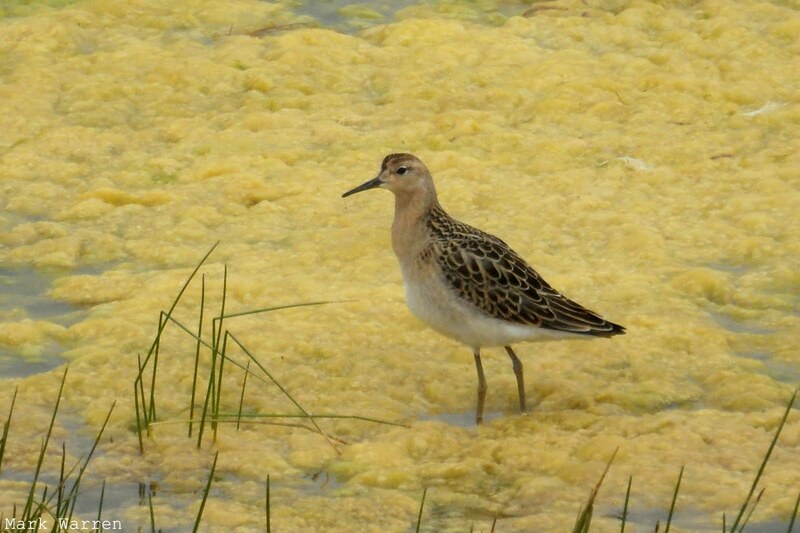 A new Ruff, an adult this time, on Trolla Vatn was the only sighting of interest on the 26th. 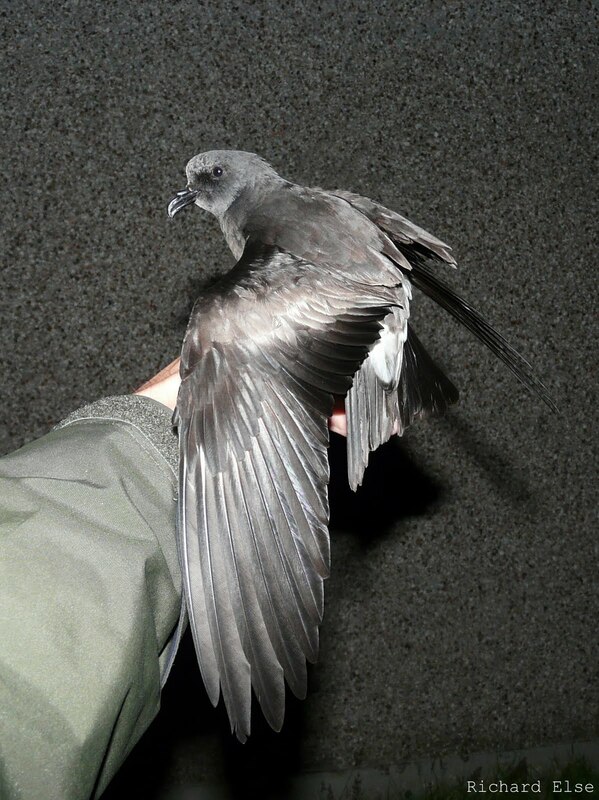 Conditions during the night were good for catching Storm Petrels, with 33 new birds ringed and another wearing a Norwegian ring. A Quail was singing at Cruesbreck on the 27th, and at least 3 Orcas were seen off the north end of the island. The Ruff was on Trolla Vatn again on the 28th, while a Garganey was at Hooking Loch and a Green Sandpiper was on the links. 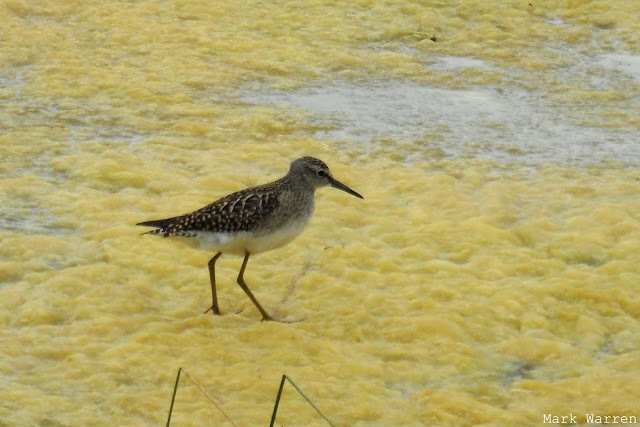 A couple of Wood Sandpipers, having discovered the feeding potential of Gretchen Loch's gooey perimeter, were exploring the mat of floating algae in the company of a juvenile Ruff. Elsewhere, there was little change to report: 2 Common Terns were with 2700 Arctic Terns at Bewan and a few Sooty and Manx Shearwaters passed by the seawatching hide. The Ruff was only the second one this year. It has been quite a good year for Wood Sandpipers: today's two are about the eighth and ninth so far. The woolly hats and gloves came back out of the drawers earlier than expected as further strong northerlies, coupled with showery weather, delivered a distinctly unsummery double-jumper day. 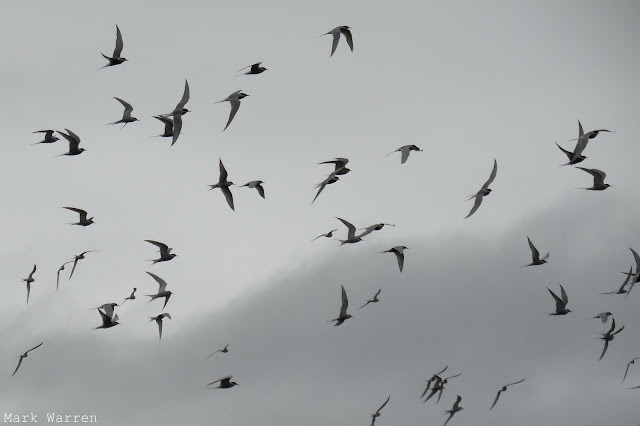 The flock of Terns at Bewan, now relocated to the sanctuary of the grassy areas in favour of the exposed shoreline, though slightly decreased in number, had increased in diversity: at least 5 Common Terns were huddled among the 1100 or so Arctic Terns, and, best of all, an adult Roseate Tern was found on the edge of the flock. A very rare species on North Ronaldsay, this is only the fifth observatory record and the first for 11 years. Two of the previous records were also in July. Seawatching produced similar results to the previous few days, with 18 Sooty Shearwaters and 16 Manx Shearwaters passing by. A Wood Sandpiper and a Greenshank on Hooking Loch were the day's highlight, and a Siskin was a new migrant. 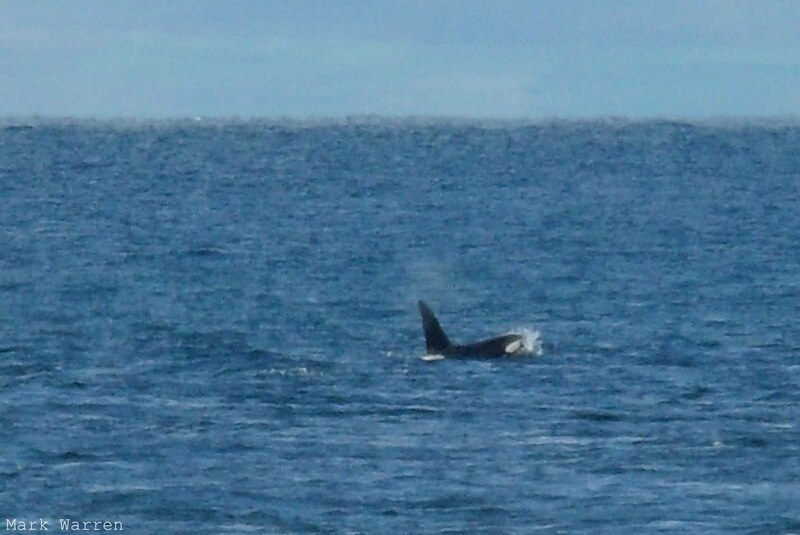 Demonstrating the value of taking regular tea breaks, a group of at least 8 Orcas was seen from the conservatory during a short rest from trap building. The pod lingered in the North Ronaldsay Firth long enough for all present to enjoy good views before departing to the west. A Greenshank was the most interesting bird sighting, although the Arctic Terns at Bewan numbered at least 2170 individuals and a Manx Shearwater passed by at sea. A bit more seabird movement past the north end of the island included 15 Sooty Shearwaters, 14 Manx Shearwaters, 132 Fulmars, 7 Storm Petrels and 1192 Puffins. The big gathering of Arctic Terns involved at least 2000 birds. A spectacular flock of Arctic Terns around Bewan Loch, numbering in excess of 1850 birds, was an impressive sight as they swarmed over the water and nearby rocks. Although such large gatherings are certainly not unprecedented here (day-counts of 5000 have occurred several times in the past), 4-figure totals have been very infrequent in the last decade. 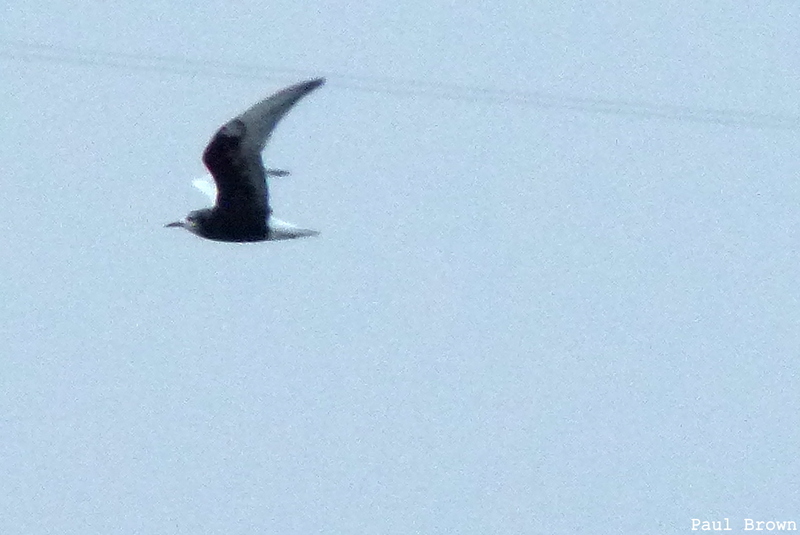 A Manx Shearwater was the only noteworthy passing seabird. There was little change in the number of waders, although 97 Redshanks and 222 Turnstones were new highest counts of the return passage period. Numbers of waders remained much the same, and 13 Storm Petrels and 10 Manx Shearwaters were the best of the day's sea passage. A Spotted Flycatcher and a Collared Dove were new migrant landbirds, but most of the day's birding interest was again focussed on the increasing flocks of waders. The most notable were 4 Common Sandpipers near the pier, while counts of other species came to 702 Golden Plovers, 382 Oystercatchers, 187 Turnstones, 181 Lapwings, 102 Dunlins, 87 Redshanks, 18 Bar-tailed Godwits, 6 Knots, 6 Purple Sandpipers and 4 Whimbrels. Nothing of any interest was seen during the morning seawatch, but some decent numbers of waders were counted around the island's coastline and recently cut fields: the latter habitat proving extremely attractive to some 335 Oystercatchers and 55 Curlews. The day's other wader counts came to 721 Golden Plovers, 83 Dunlins, 77 Sanderlings, 113 Turnstones, 9 Knots and 3 Whimbrels. A two hour afternoon seawatch in expectation of Sooty Shearwaters didn't disappoint, half a dozen birds duly passing by the hide on a south-easterly tail wind - another tick, number 184, on the year-list. Other seabirds included 6 Manx Shearwaters and 341 Fulmars. An influx of Sanderlings brought 110 to the beach in Nouster Bay, 2 Swifts were seen and a Common Redpoll was still present. The first Pintail for some months and 2 Woodpigeons were the best new arrivals, although 11 Swifts and 4 Sand Martins might also have been new migrants. A Manx Shearwater was the highlight of an uneventful seawatch, 36 Sanderlings were in Nouster Bay and 3 Common Redpolls remained at Holland House. 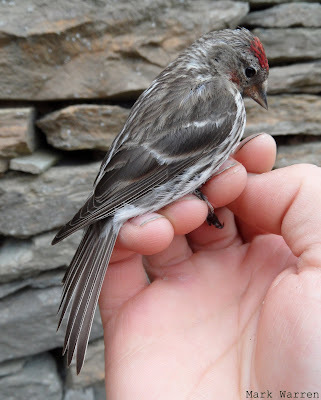 The recent influx of Common Redpolls and Siskins is quite unusual for the time of year. 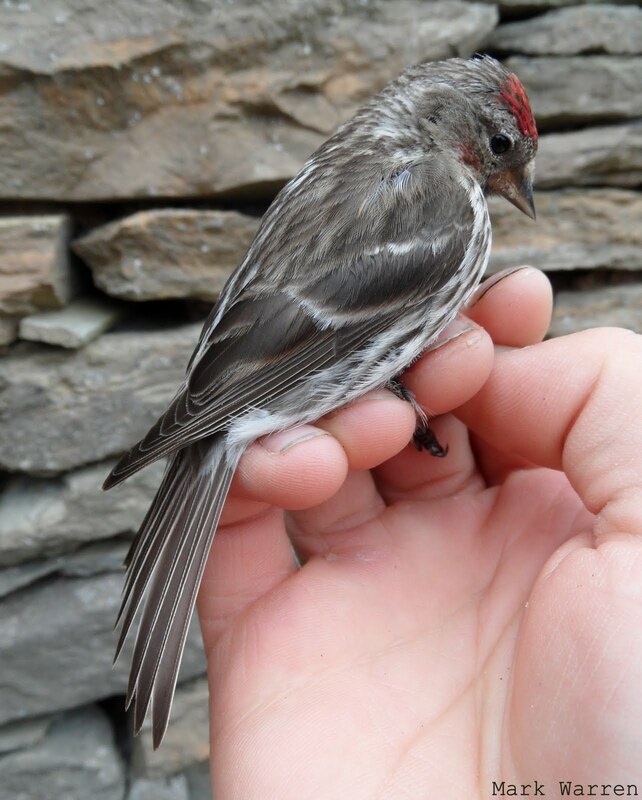 The Redpolls have included one juvenile bird and several worn-looking adults like this one. A Redwing was an unexpected migrant for the middle of summer, but there was not much else of interest. A Sand Martin passed through and 6 Whimbrels were seen. A small selection of migrants made for a slightly more interesting day's birding. At least 51 Swifts, the highest count of the year, were seen catching insects over the lochs and fields, along with 13 Sand Martins and 2 House Martins. A new Chiffchaff and 4 Common Redpolls were at Holland House, a Lesser Redpoll was at the north of the island and a Collared Dove arrived. A Peregrine flew north out to sea, and 7 Knots and 12 Dunlins were the best of the waders. Proving that a very early start in the morning does sometimes pay off, the ringing highlight of the day was an adult Great Skua that was caught in the gull trap at half past five in the morning. 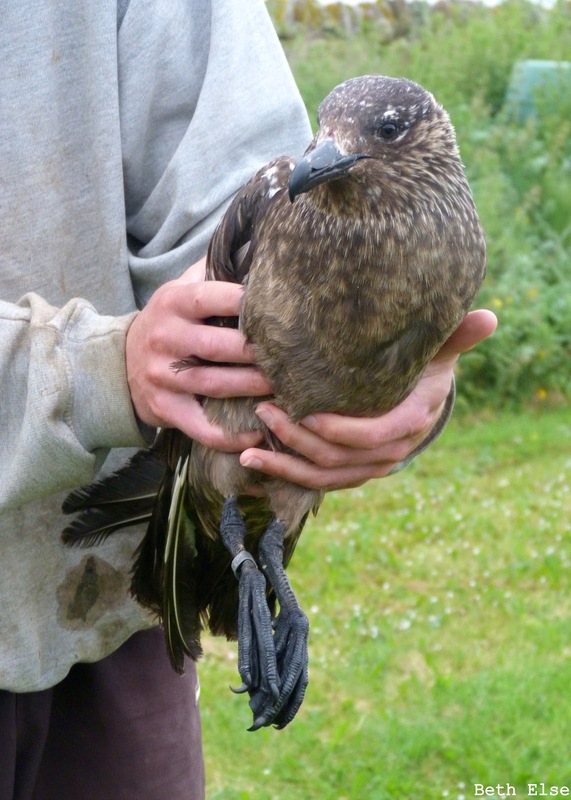 Great Skuas are often seen here, but this was only the second fully grown bird to be ringed on the island. No migrants worth reporting were seen all day. 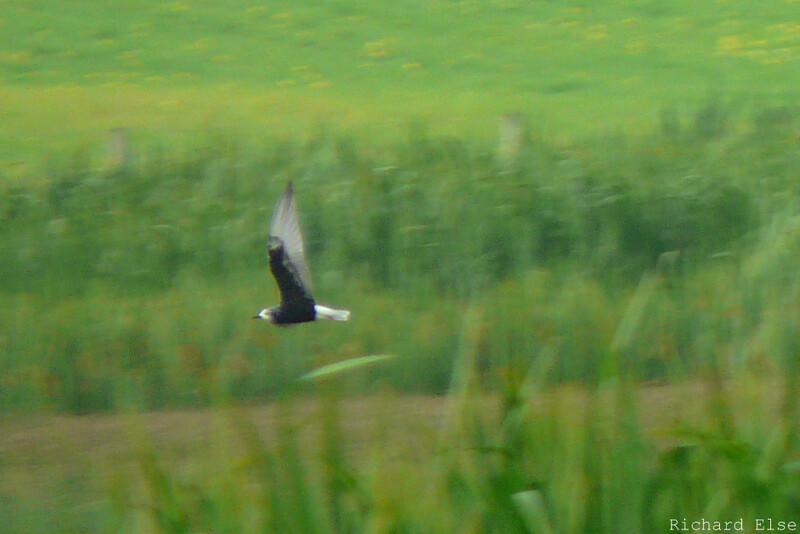 The White-winged Black Tern was still present at Ancum Loch in the morning, but was not seen after midday. A juvenile Garganey in the company of an adult female was further confirmation of the species breeding here this year. Waders included 686 Golden Plovers, 108 Curlews, 2 Whimbrels and a Black-tailed Godwit; the only passerines of note were a Sand Martin and 2 Common Redpolls. A totally unexpected, and totally stunning, adult White-winged Black Tern was found at Ancum Loch in the afternoon. In an island context, this is the rarest bird of the year so far: the only previous observatory record was a bird seen flying down the main road in August 1997. Besides the tern, there was very little of interest. A seawatch in the afternoon produced just 5 Manx Shearwaters and 3 Storm Petrels, and 12 Purple Sandpipers were the only different waders. Inspired by events at the opposite end of the country, an optimistic visit to the seawatching hide to look for Cory's Shearwaters produced nothing more interesting than 2 Storm Petrels, 2 Manx Shearwaters and a Red-throated Diver. The only new landbirds were 3 Swifts and 4 Common Redpolls, 2 of which were trapped and ringed in the evening. The first Hummingbird Hawkmoth of the year was the highlight of the day. New birds were very thin on the ground, with 6 Whimbrels and 3 Purple Sandpipers the most interesting sightings. 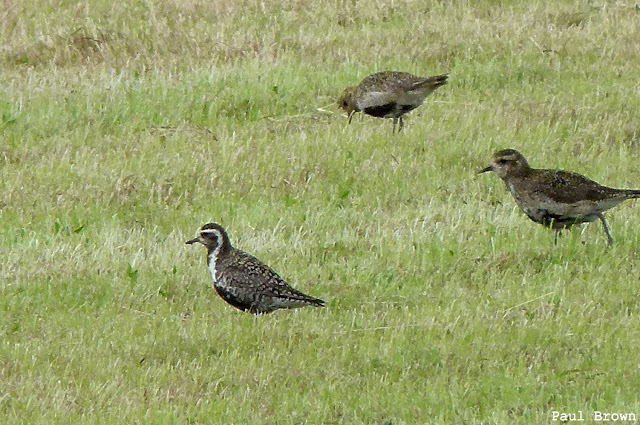 Many of the Golden Plovers, the Pacific one included, seemed to have departed by morning. A Quail singing near Cruesbreck was a nice surprise, but there was little else to report. The 2 Common Redpolls were still present and a Siskin was at Holland; a single Swift flew through; and 12 Dunlins and 26 Sanderlings were the most notable new waders. An elusive Pacific Golden Plover was seen several times during the day, although it was very difficult to keep track of among 590 or so widely scattered, highly mobile Golden Plovers. Pacific Golden Plover seems to be a real North Ronaldsay speciality, with a remarkable seven previous birds that account for nearly ten percent of all accepted British records. Other wading birds passing through included 4 Knots, 2 Whimbrels, 46 Bar-tailed Godwits and a Black-tailed Godwit. A Collared Dove and 2 Common Redpolls were the only other migrants of note. Wader passage remained the only source of birding interest, with counts including 12 Knots, 5 Sanderlings, 5 Dunlins, 32 Bar-tailed Godwits, 4 Whimbrels and 87 Curlews. A new species for the year was a Hobby, seen briefly near the lighthouse in the morning and again at the observatory in the evening. An influx of Curlews included a flock of over 100 at the north of the island and 3 Whimbrels were also seen during the day. The breeding Arctic Terns all failed in their nesting attempts some weeks earlier, but the lingering birds were joined by 2 Common Terns and 5 Sandwich Terns. 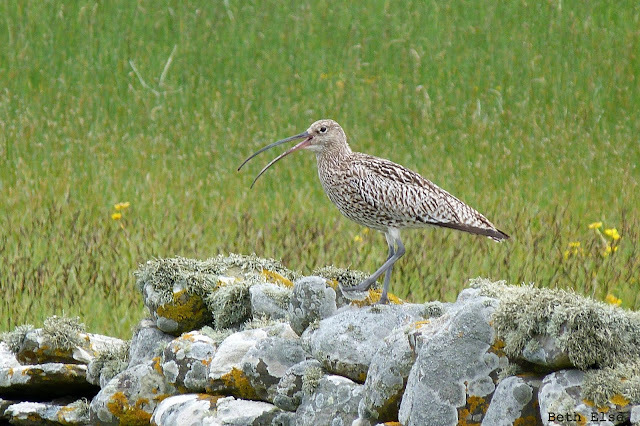 Several pairs of Curlews nest on the island, but much greater numbers occur on migration. In addition to today's flock, small groups passing south overhead have been a regular sight during the last few days. The only birds worth mentioning from an uneventful day were waders, whose early southward passage continued to progress. A couple of Purple Sandpipers, the first for a while, were with a flock of 109 Turnstones at Westness; a Whimbrel flew overhead and 332 Golden Plovers were in the fields near Holland House. 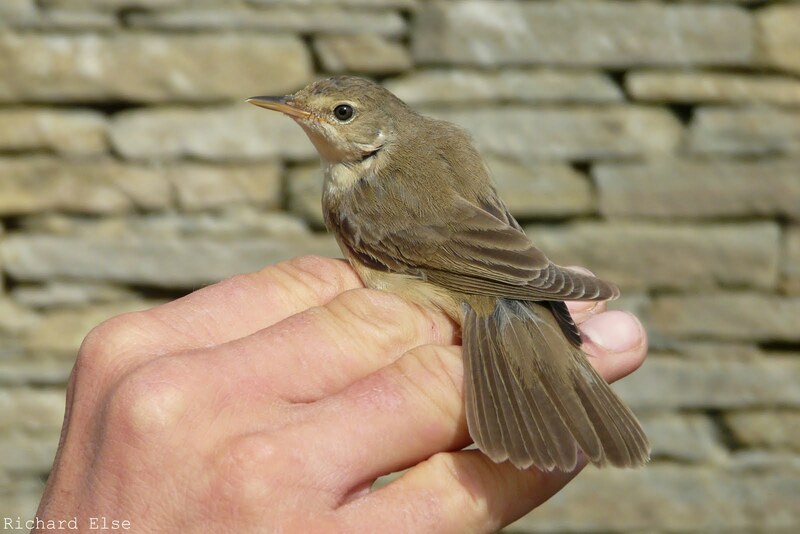 The second Marsh Warbler of the year was singing at Holland House in the morning, and was soon trapped and ringed. A Garden Warbler was also trapped and 7 Collared Doves were seen nearby. The Marsh Warbler was singing from the same corner of the garden as the Blyth's Reed Warbler last month. The song contained frequent mimicry of House Sparrow and occasional Grey Heron imitations. Interestingly, given that it was a male, the bird was at the lower end of the usual size range for Marsh Warblers, with a wing length of 69mm. A few instances of bird movement were observed during another sunny day on the 28th. Diurnal migrants passing through were 22 Swifts and a Kestrel flying south, while new birds to arrive in the morning included a Sedge Warbler, 2 Common Redpolls, 6 Collared Doves, a Woodpigeon and 3 Grey Herons. Golden Plovers reached 196 and a Sandwich Tern was in Nouster Bay. There was less to report on the 29th, but a Garden Warbler singing at Holland was new, the number of Knots increased to 45 and one of the Common Redpolls was still present.